Alfy combines Jump 'n' Run action with challenging puzzles. In a beautiful, starry night Alfy leaves his home and wanders off to find the magical fern flower that is able to fulfil any desire. Alfy is the youngest son of an old and wise forest spirit and with this noble quest he wants to prove himself. Of course Alfy is young and inexperienced so he would probably never succeed if it wasn't for your help. 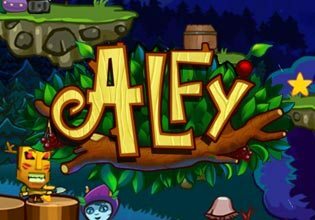 Take Alfy by the hand, help him on his path and with a little luck you will not only find the magical flower but also the beautiful princess in need of rescue. Play Alfy now for free and discover the very best Jump 'n' Run game in your browser!